"I have been making Thanksgiving dinner every year since the 1970's. I have tried every kind of turkey gravy. I created this recipe about 15 years ago. It is everyone's favorite, even the people who hate mushrooms. Serve with roasted turkey and cornbread stuffing!" Melt butter in a large stock pot over medium-low heat, and cook the mushrooms until they are browned and the butter is clear, 1 to 1 1/2 hours. Remove the mushrooms, coarsely chop them, and set aside. There should be about 1 cup of butter left in the stock pot; whisk the flour into the butter, and gently cook over low heat until the flour mixture turns mahogany brown in color, about 20 minutes. Whisk in the chicken broth; bring the mixture to a simmer to thicken the stock. Pour the turkey drippings into a saucepan, then cook and stir the onions and celery in the drippings over medium-low heat until the onions begin to turn brown, about 20 minutes. Stir the drippings and vegetables into the thickened stock. Bring the gravy to a gentle boil, reduce heat, and simmer for about 20 minutes to blend the flavors. Stir in the chopped mushrooms, then season to taste with salt, black pepper, and cayenne pepper. 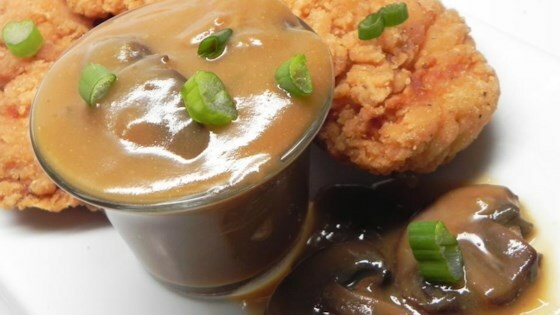 Watch how easy it is to make homemade turkey gravy. The amount of drippings from a roasted turkey can vary; this recipe assumes about 1 1/2 cups of drippings. If there's more than 3 cups, reduce the amount of chicken broth by 1 can; if there's only 1/2 cup, add 1 more can of broth. i made this it was fantastic. i only cooked the mushrooms for twenty min instead of hour still came out fine. really good will use again ! So worth the time and effort into making this gravy! Turn out wonderful and delicious. Will definetly make again. 2nd time I've ever tried to make gravy and OMG this is amazing!! I felt like I was channeling my inner Julia Child so this recipe is tasty and fun.